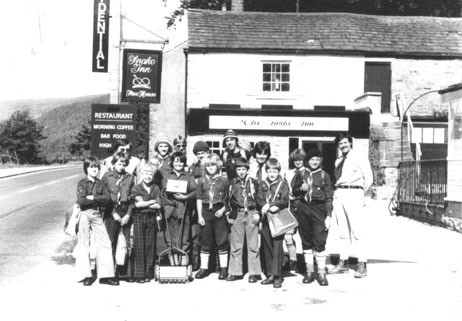 December 7th 1984, Scout and Venture Trip. 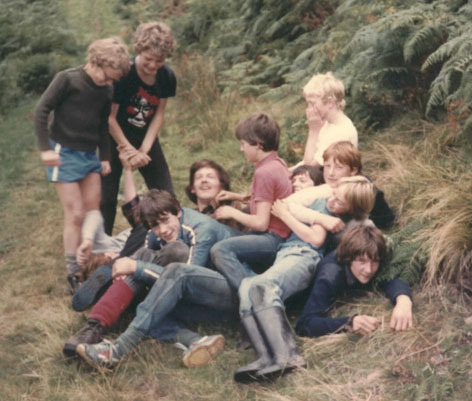 Me, Dave Elks, Kevin Clarke, Flod, Duff, John Widdop, Ian Vallans, Roger Godber, Jimmy Knifton, Jamie Widdop, Robert Benson, Matt Lister, Mark Pollard, Dave Jerram. Friday 7th - Drive up to Alport with Duff, call in at the Yorkshire Bridge. Have egg banjo's and soup when we get to the hut. Leaders sleep in the hut, Scouts fight in the bunk room till 4am. Saturday 8th - Wake up at 7am. and cook breakfast. 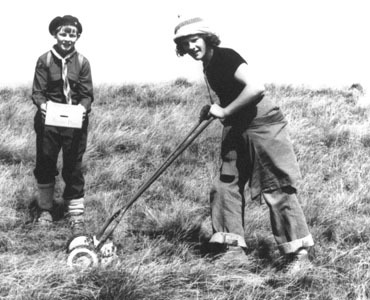 Walk up the valley and back along the top, do some compass work with the scouts. Have a packed lunch. 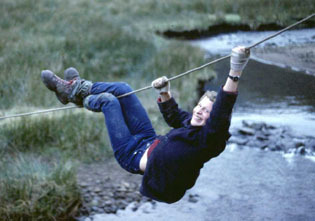 Build a rope bridge over the river. Me and Ian cook spag bol. Take Duff, Widdop and Flod down to the Yorkshire Bridge. Sunday 9th - Sid Vallans comes up for the day. Set up a compass reading course near to the tower. Have a good fire. Leave the hut at 5.30, stop for a Chinese in Matlock. Friday 30th - Go up in Min's car. Hazel and Dave take their landrover. Go to the Cheshire Cheese in Castleton in the landrover. Sunday 31st - Me and Dave E walk over to Castleton, start at 7.30am, very windy. New Year's party in the Yorkshire Bridge. 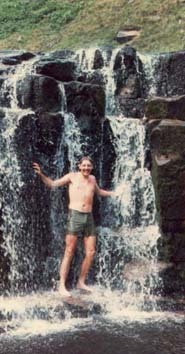 Monday 1st - Me and Dave start the new year by was washing in the stream. Friday 15th - Drive up with loads of gear. Saturday 16th - Walk up the valley with Nibe, Swim and shower in the river a lot. Sunday 17th - Walk over the castles and up the valley with Nibe and David. I run down the length of the valley when a thunderstorm starts. June 19th 1983. 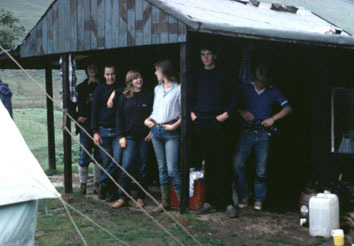 Call in at Alport hut for the 50th year celebrations. Unfortunately everyone had gone by the time we get there. 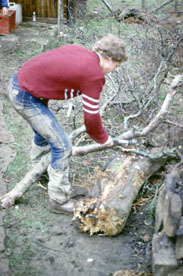 These two pictures are from sometime in 1982 but not necessarily the same time. This is AC, Ian Vallans, Kevin Clarke and ? 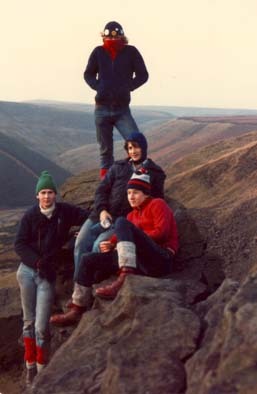 standing on the top of the Alport Castles. Friday 31st - Minibus up to Alport, get there at 11.30am. Cut my head on a stick, Louise patches it up. Go to the Yorkshire Bridge for a party gets out of hand. Wake up clinging to the side of hut in the darkness, it takes a long time to work out where I am. Saturday 1st - Slow start get up about 3pm, Walk up the valley with Nibe. Play darts all night. Sunday 2nd - Spend all morning chasing a dog from the farm with AC. Nibe, Hazel, Heather and Sally go home. Monday - 3rd Raining all day. Come back in the minibus with AC, Min, Neil Ian Vallans and Louise. Friday - Go to the Yorkshire Bridge, have a sing song round the fire. Saturday - Walk 12 miles to Derwent Water. Dolf comes up for his stag do. Have 40 pints between us. I end up tearing Clive's shirt. Sunday - Rainy, go to the Bull's Head in Castleton. 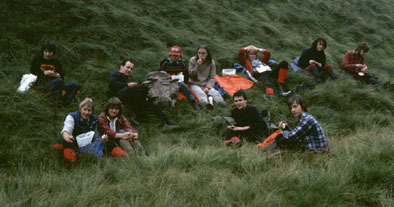 Venture Trip - I leave Leeds at 1pm, catch the train to Edale, walk over to the hut, arrive at 6pm. Wait 5 hours in the dark for the others to arrive. Saturday - Set off at noon up the Alport valley onto Bleaklow, down to the Snake Pass. Go up the Snake path and around the edge of Kinder. Get back at 7pm in the dark. Sunday - Have breakfast at 1pm, packup and go home. I get dropped off at Bamford railway station. 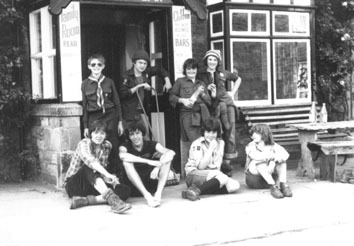 Group of scouts at Alport September 1981. March 7th 1980. 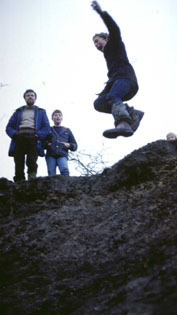 Venture Trip with Nibe, Min, Dave, Clive. The girls stay at Hagg Farm. Saturday walked round Derwent Dam and over the castles. Sunday walk up the valley. 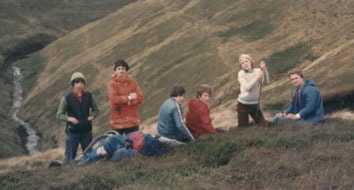 Sponsored Lawn Mower Push over Kinder Scout, August 19th 1978. 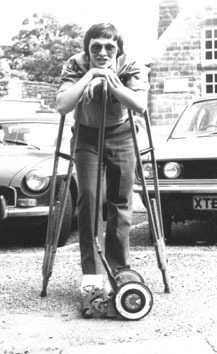 Dolf broke his leg shortly before the event took place. Philip Toms and Karl Moore with the lawn mower. March 3rd 1978. 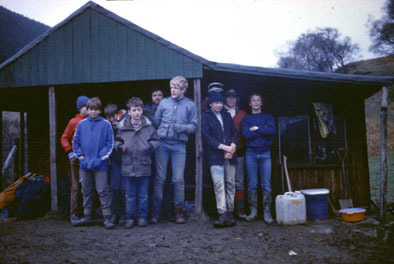 Scout Trip with 9 scouts and 3 leaders. 17 mile walk on Saturday over to Edale. October 22nd 1977. My first time to the Hut. We catch the train to Sheffield on Saturday morning. Meet Dolf there. Get the train to Hope. Walk up to the hut carrying all our gear.